Better interpretation your houses and signs. Tips. It will demonstrate you how to calculate the balance of elements in your natal chart in order to understand which element you have: weak or dominant. The majority of charts have almost even number of elements, which means that they have certain planets (+ the Rising sign) attached to all Zodiac signs. However, if you have uneven combination of elements, like five or more, you would probably be identified with that dominant element, no matter what your Zodiac sign is. In other case, if you lack of some elements, or have only one or two planets assigned to an element, it means that the features of this weak element are not as present in your life, as the characteristics of the dominant one. It is really hard and time-consuming for you to work or do things in sphere of this weak element. Sometimes, people who feel that they are weak in a particular sphere, start doing their best to achieve better results in it, and they do, because they work hard and natural predisposition is beaten by hard work and stubbornness. As a result, through a lot of efforts people with weak element have strong expression of it. The point is that succeeding is never easy for them, it takes a lot of time, big deal of efforts, nerves, and deserves recognition. Two points of an element denote a slight lack; zero to one point may denote an essential lack, unless there is a compensation in somewhere in the chart. It is quite easy to check the overall balance of the elements, however, it is needed to go through the whole chart and see the full picture, maybe you will find something interesting in the rest of the chart. 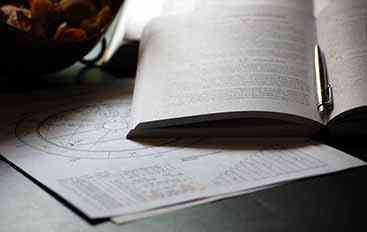 In Astrology the interconnection of details makes difference. Take into account that there are particular compensations for weakly expressed or deficient elements that can overbalance the person, if the compensation can be found in a chart. Also, the existence of compensation does not erase the lack itself. Compensations only boost the wish to be like a certain element, though there is no natural ability to be so. A few compensations are described in the interpretations beneath. Dominant or weak element is usually obvious by a person's temper, but the element of every House cusp ruler will show a character of a person according to the branch of life assigned to each House. If one of the above is in the 29th degree of any sign, split the point between this element and the next sign element, as it is too near to 0° of the following sign. Add to each element half a point in such situation. There should be a total of 13 points. 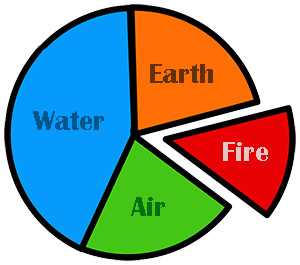 Now, count the points for each element. The element refers to dominant if it has more that five points, five points is also ok. 6+ points speaks for predominance. The element is weak in case it has no points at all, or only one point. It goes as well for 2 or more points, but it happens when we include Pluto or Neptune, that's why such elements will be weak. Your native chart chart reveals the location of the heavenly bodies when were born and their location defines your future character, habits, gifts and faith.